Promotional poster for Sac City Express’ new website. Illustration by Vivian Liu. The Express would like to welcome City College’s students, staff, faculty and the community to its brand new website. The site features an all-new look, a new section for blogs, easier navigation to all of the Express’s articles, pictures, and videos, and more room to showcase the stories that highlight the campus’s news, sports, events and student success stories. According to JoAnne Obata, a web development major and one of six students who worked on the project, the website was redesigned over the course of the spring 2012 semester. The students were members of a web projects combination course that combined computer information science – web (CISW) 470 and graphic communications (GCOM) 370. Rebuilding the new site was a collaboration effort not only by the six students involved in the web projects course, but by the student leaders from the Express, as well as the journalism faculty advisers. According to Obata, the new site took inspiration from the old version of the Indiana Daily Student and the Boston Globe. The project’s goals were for the site to look and feel like a professional news publication, to have an easy-to-use interface and to not require any programming to maintain, Obata says. To help keep the site up to standards and troubleshoot any issues the staff may face, Obata and the Express fall 2012 web manager, Kate Paloy spent the summer working on an all-inclusive manual that shows how to do everything and anything the current and future Express staff will need to know. Another goal was to help the Express gain more reader traffic, says Obata. The old site had a lot of glitches, was slow and overall did not provide an easy user experience, which caused a lot of readers to avoid using it. 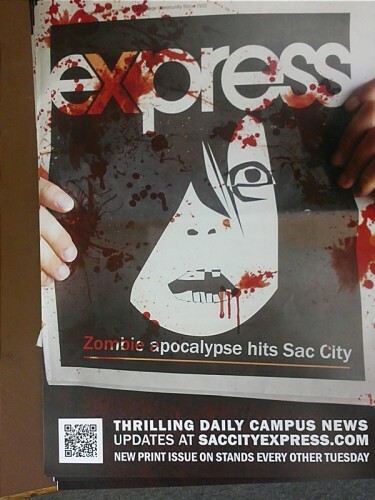 With the help of a new advertising campaign—which consists of more integration of the website in the print edition and the hanging of eye-catching posters of a coming zombie apocalypse around campus—the Express hopes to drive reader traffic up and get the City College community more excited about the publication. That’s not all the Express is doing to generate more student involvement with the newspaper though. A podcast that will feature audio from interviews, live commentary from Express reporters, and more of the same great coverage the City College community expects from the Express is in the works and should be debuting soon. Additionally, the site still showcases classic Express features—like the “Oh Snap!” picture of the day, weekly polls and coverage of all of the happenings around campus—the site also features up to five blogs—including one on video games and another on fashion—interactive events and sports calendars, more videos and photos, better search functionality, and interactive PDF versions of the Express print edition, which will be posted after each issue’s release. Despite the website turning out so well, there were several obstacles the team faced along the way. Joe Pea, a computer science major with a focus on web development, says the most difficult part was keeping everyone on the same page. “We overcame the obstacle by setting up a version control system called ‘Git’ that allowed for anyone on the team to make changes to the source code of the website and for anyone on the team to view the history of changes from the beginning of our time developing the website,” says Pea. Kim Colunga, a web development major, was another student who worked on the project, and she says her obstacles in creating the new site were more personal. “A challenge for me was working full time, taking other classes and living in Contra Costa County,” says Colunga, who added that Pea’s “Git” system helped her in communicating and collaborating with the team. The positive feedback about the new site has been overwhelming and one thing is for sure, getting information about City College has never been easier. Don’t just take our word for it—have a look around, try out the new features, answer the poll and then tell your classmates, friends and everyone you know in the community about the Express and its new website. This entry was posted in Features, News, Sac City Express (SCC) and tagged blogs, campus, City College, community, daniel wilson, Express, features, html, http, JoAnna Obata, Kate Paloy, los rios, new site, news, online, Opinions, podcast, sac city, saccityexpress.com, SCC, sports, web, www. Bookmark the permalink.